iPhone Charging station: Vertical Charging Station Compatible iPhone X/8, iPhone 7, iPhone SE, iPhone 6s/ iPhone 6s, iPhone 6, iPhone5/5s. (Phone or charging cable not included). Perfectly suitable for 4.7 inches-iPhone. But it might me slightly unstable with 5.5 inches-iPhone. Space-saving Design: Small volume, light weight, reasonable design helps maximize the use of space. 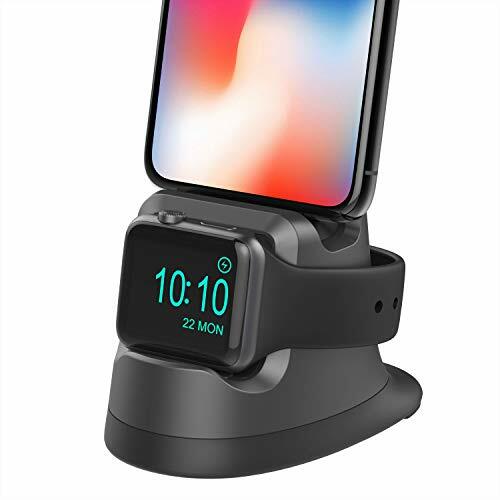 Efficiently organize and charge for iPhone and Apple watch. The non-slip pad on the bottom enhances the stability of the whole unit. The anti-scratch Silicone protect for Apple Watch and iPhone from scratching. Easy to assemble and use: Just Installing the original charging cable and watch Magnetic Charger. 4 kinds of silicone cushion are designed to make it works just fine with or without a case, which means you do not have to take the case off when charging for your iPhone. Hands-free interaction like Face Time or Skype. PLEASE NOTE: DOES NOT include any IPHONE, APPLE WATCH, APPLE AIRPODS AND THE CHARGING CABLE, APPLE MAGNETIC CHARGER SHOWN IN IMAGES.